The Los Angeles Angels put their faith in MIke Trout. That’s a good idea (Photo, Washington Post). The Dodgers are bullish on Justin Turner as well as their leader this season. (Photo, MLB Trade Rumors). The big news in major league baseball so far this year was the free agent signings of Bryce Harper and Manny Machado and the massive contract that Mike Trout signed with the team he’s been with for 8 years, the Los Angeles Angels. Harper inked a 13 year, $330 million contract with the Philadelphia Phillies. He’ll make over $25 million a year. Great player. Will see how he does in Philly on a team that is banking on making a deep run in the postseason this year. Machado signed a 10 year $300 million contract with the San Diego Padres, another team trying to step it up and be a World Series contender. Not sure they’re ready yet, but with Machado and some other talented veterans, and the best farm system in baseball, they could get there next season and be very competitive this year. Finally, Trout, the best player in baseball, signed a blockbuster, inking a 12 year, $426.5 million contract, which will pay him $35 million a year. He’ll be the highest paid player in baseball. Machado and Harper are 26 and Trout is 27. They are some of the major faces in baseball right now. To give an example of Trout’s talent, he hit .312 last year with 39 homers and 79 RBIs on a team that has struggled to make the playoffs, making it only 1 of Trout’s previous 8 seasons, because there is not enough talent around him. His WAR, wins above replacement value, which is a key metric now in baseball that measures a starters’ winning games number over a replacement player with a lesser contract and value, was 10.2, which is excellent. Only the Red Sox Mookie Betts had a higher WAR at 10.4. Trout has had a WAR of 10.5 twice. In 2012, he hit 30 homers and drove in 83 runs and stole 49 bases to lead the American League. In 2016, when his WAR was 10.5 also, he hit 29 homers, drove in 100 runs and stole 30 bases in 37 attempts. His OPS last year, on-base plus slugging percentage, was 1.088. Over .900 is considered outstanding, so that’s off the charts good. He’s the epitome of a classic 5-tool player that all teams want; he can hit, he can run, he can hit for power, he can hit for average and he’s got a cannon for an arm. So in these days, where it’s an arms race to get the best player, LA secured their stud. Now they just need to add some more pieces around him. This season should be terrific with so many teams in the hunt for the World Series title. The Yankees are loaded with bats, the Red Sox have everybody back from their World Series winning team, the Houston Astros are angry, talented, and ready to prove that 2017 wasn’t a fluke. In the NL, the Nationals lost Harper, but they have a strong team returning with Max Scherzer, Stephen Strasborg and Patrick Corbin, who came over from Arizona after a terrific season in 2017, anchoring their staff along with excellent position players. The Phillies will be a factor with Harper and the Braves have pretty much everybody back. The Cubs will try to recapture some magic from 2016, The Milwaukee Brewers, fresh off their NLCS appearance last season where they fell to the Dodgers, have everybody back. The Cardinals signed superstar first baseman Paul Goldschmidt and look impressive on paper. The Dodgers are back with superstar shortstop Corey Seager healthy. The Dodgers will be very formidable. With that said, here are my predictions for the 2019 season. The Dodgers knocked on the door 2 years ago, losing to the Astros in 7, then knocked on it again last year, losing to the Red Sox in 5. This year I like them to knock it over behind 3rd baseman Justin Turner, shortstop Corey Seager and a staff led by Clayton Kershaw, who will be on the 10 day DL to start the season, but is throwing well according to reports, and Walker Buehler, the 98 mile per hour hurler, who has developed a very good change up to go with his heat and a stellar curve ball. The Dodgers have the best record in baseball and grab home field winning their 7th world championship, but first since 1988. That’s 31 years. The Dodgers end the lengthy drought with excellent pitching and outstanding position players. 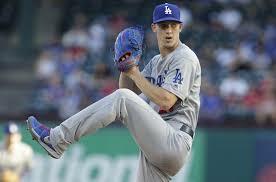 I like 24 year old Walker Buehler to play a big part in getting the Dodgers their first World Championship since 1988 (Photo, Dodger Blue). The Crimson Tide has hired Nate Oats as their next head basketball coach. Oats replaces Avery Johnson. Oats, 44, coached Buffalo for 4 seasons compiling a 96-43 overall record and 3 NCAA appearances. His last 2 teams have advanced to the second round of the tournament, defeating Arizona last year and Arizona State this year before falling to a highly talented Texas Tech team on Sunday in the second round. Looks like a good hire to me.